Similar to Indonesia, the geography of the country - an archipelago of islands covering a large area - has affected the development of languages. There are a number of main cultural and language groups, which are not always the same. And, there are still a vast number of less-spoken languages scattered throughout the islands (Ethnologue lists 185!). Also like Indonesia, the Filipino government has promoted an official language - 'Filipino' - to everyone through the school system to create a common identity and enable all cultural groups to communicate with each other. ('Filipino' is not used by most Filipinos to refer to the national language - they simply call it Tagalog.) However, due to its history as a US territory and the introduction of the American school system with teachers to the country in the early 1900s, Filipinos since have continued to learn English in school and use it to varying degrees as an official language and means of communication. Today, with the demand outside the country for laborers, nurses, and teachers who speak English, this fact has served the population well and allowed many to work overseas, sending money back to their families. The main languages of the Philippines are: Tagalog (the official national language - traditionally spoken around Manila), Pangasinan (Dagupan) and Pampangan (Angeles, San Fernando) in central Luzon, Ilocano (central - northern Luzon), Bicolano (southern Luzon), Waray-Waray (Samar and surrounding islands), Hiligaynon (Panay, Negros), Cebuano (Cebu and south including most of Mindanao), and Chavacano (around Zamboanga). Cebuano is the widest spread language spoken as a first language geographically. A number of ethnic tribal languages are spoken around Bontok in north-central Luzon. 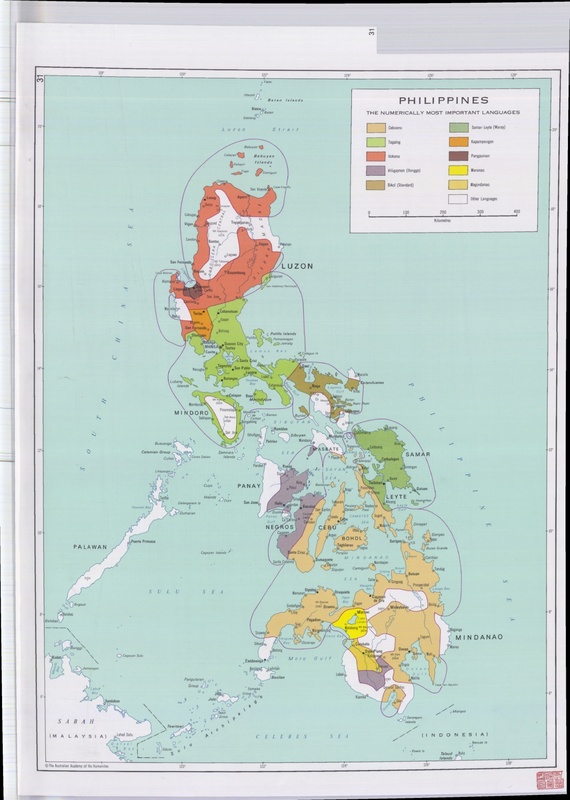 Other significant languages (for government, military, and development agencies) in Mindanao include Maranaw/Maranao, Maguindanao, and Tausug, all of whose speakers are predominantly Muslim. In Zamboanga, Chavacano is spoken, which contains a lot of Spanish. For a more detailed language map, click here.